Many of the Native American culture also revolve around their religious beliefs. In fact, they believe in different sacred spirits. The kachinas are believed to be sacred spirits that represent many aspects of nature. As a matter of fact, the affairs of each Pueblo town is controlled by the Pueblo priests who conduct elaborate masked rituals which are dedicated to the kachinas. 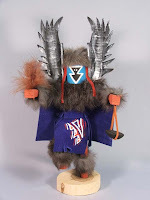 Example, a buffalo kachina may dance in prayer for the abundance of buffalo sources. The men who usually impersonate the kachinas would dance in the plazas of their Pueblo. They then would usually carve small wooden replicas of the kachina they impersonate and present these to the infants and girls of any ages. The Hopi call these carved and painted figures as "tihu" while it is known as kachina "doll" for the other Native Americans. Although it is called a "doll", it is not a toy for children, but it is simply a representation of a particular kachina. It is believed that it also has the kachina spirit's power. Once the kachina doll is presented, it is considered a valued possession and is not treated as a toy. Today, kachina dolls can be a work of art that are given as gifts hoping for a future abundance and health. On the other hand, other people collect different kachina dolls. Among the popular kachina doll collectible is the crow mother kachina doll which is also available online at http://www.nativeamericanindians.net.